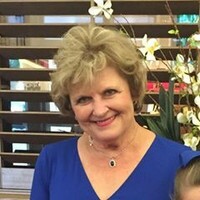 Sue Richter went to be with the Lord on September 7th after a short fight with an aggressive cancer. She was born on November 20, 1946 in San Antonio to Harold and Emma Faye Hild. She was a beloved mother, grandmother, and friend. Her life revolved around her family and friends. She loved cooking, baking, and engaging in activities with her grandchildren. Sue was preceded in death by her parents Harold and Faye Hild. She is survived by her husband, Chester Richter; her sister, Cheryl Ornelas; her brothers, Russell , Donald, and Brian Hild; her children and their spouses, Reagan and Laura Richter, Ryan and Honey Richter, Rhonda and Aaron Krause; grandchildren, Miranda, Lakyn, Dryden, Emma, and Nolan Richter, and Reese and Riley Krause. Visitation will be on Wednesday, September 13th from 6-8 pm at the Sunset Funeral Home Chapel. The funeral service will be on Thursday, September 14th at 10:00 am at the Sunset Funeral Home Chapel. In lieu of flowers, please make donations to either St. Jude Children's Research Hospital or the Children's Hospital of San Antonio. Very sorry to hear . Homeroom classmate. Very sorry to hear of Sue's passing. A good person/friend. Bill and I were saddened to hear of Sue's passing. She was so kind and cheerful. It was a pleasure to spend parts of our childhoods with her. Glad she has left the world the legacy of her children and grandchildren. Rest in peace, sweet friend.